The Alumni Association at Webster's Vienna campus interviewed Aleksandra Mandrapa (MBA '08) for its January Alumni Spotlight. Mandrapa is a business development manager for SHI Beteiligung, a group of companies active in event management, cultural tourism and the digital arena. 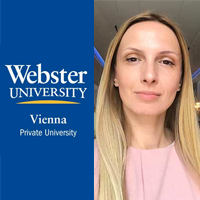 Aleksandra, what made you choose Webster Vienna Private University? At the time, I was sure I wanted to study at the American University. Matching the university I wanted with Vienna as a location (I am originally not from Vienna) seemed like a very good combination. Soon it became clear to me that I had made the right decision. What are your favorite memories from your time at Webster Vienna? Probably one of the favorite memories is the multicultural aspect of Webster Vienna, which made us look like one of the UN agencies (Webster Vienna students come from over 70 different nations as I recall). This variety was a priceless add-on to both for studying as well as group and for the social aspect through multicultural friendships. What have been some of the challenges in your career? And, how did you overcome them? I believe the biggest challenge for many of us who decided to stay in Vienna after finishing university was starting from scratch in a business environment that we didn’t know so well. In addition to this, for me, is the fact that at the time I wasn’t fluent in German. How do you think your time at Webster has helped you prepare for your career-oriented experiences? My time at Webster Vienna shaped me in so many different ways. First and foremost, acquiring knowledge at Webster required our active engagement, rather than passively learning shortly before the main exam. This active engagement habit stays even after university. Secondly, this knowledge, with its practical application in almost any business situation, boosted my self-confidence. I still, when asked about my work experience, first mention where I studied. Read the full interview at the Webster Vienna site.